Frightening information about the history of the Pledge of Allegiance is at http://rexcurry.net/book1a1contents-pledge.html (with shocking historical photographs). As an attorney in the U.S., I deal with environmental laws including criminal charges. As I write this, I am about to speak at the Hague to a Netherlands political party about environmental laws and the Florida Everglades. Most of North Holland is man-made land reclaimed from the North Sea. I advocate land reclamation in Florida Bay to expand the Everglades. Everglades land reclamation will create more aquifer, swamps, marshes, wetlands, beaches, farmland and buildable areas for bigger populations. The land will be untouched by phosphorus. It will solve saltwater intrusion by pushing saltwater farther out. It could double the size of the Everglades. The project could start in the northeast of Florida Bay, and progress in a west/southwest direction along the Everglades National Park’s land boundary. The new Everglades could be bigger than Rhode Island. It could be the 51st state. It could be called "New Florida." If the new land is a free port it could make Hong Kong look like an overregulated socialist haven! The new everglades could extend even farther than Key West. John Gifford, a University of Miami marine biologist was quoted in a newspaper article and stated, "The Florida peninsula was two times its current size back then [12,000 years ago], and the Gulf of Mexico was more than 100 miles west." He said Florida was not a desert, but it was an arid climate. Each Florida spring was an oasis. "Restoration" is a slippery word that eco-nuts use to mean destroying modern progress. "Restoration" could maintain modern progress if the everglades are enlarged. It would be restoration project that restores the size of the everglades to conditions similar to before modern development. Similar ideas have been urged regarding reefs. My ancestors helped settle Key West and the Curry Mansion is still on the local tour. Nearby, Smathers Beach is a man-made beach, and one of Florida’s top ten. As a sixth generation Floridian and a lifelong resident, I treasure Florida’s environment. Waterfront property would remain waterfront with space left between old owners and new land. The project could leave many waterways, including a cross-state waterway along the present southern border of Florida. One key to success will be to keep government out. Much of Florida Bay is part of the Everglades National Park, so the Bay needs to be privatized. Much Florida water is socialized and Florida land is 30 percent socialized (government-owned). All freedom is founded on the private ownership of property. The former U.S.S.R., East Europe, and China prove that socialism is environmentally disastrous. 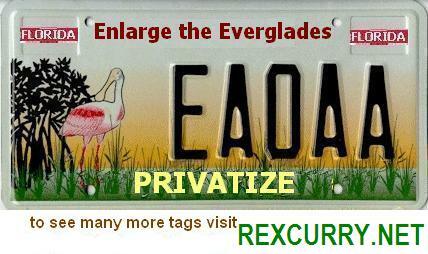 The Everglades prove that socialism is environmentally disastrous for Florida. Government built roads through the Everglades, straightened rivers, drained wetlands, cut canals, and subsidized cattle and sugar with taxes and other socialism. The government has already done more damage than private enterprise could ever have afforded to do. Government’s restoration plans are costly frauds. Instead of restoration plans, the Everglades need capitalist expansion plans. Let’s fight the government’s antidisestablishmentarianism. The best environment is a capitalist environment. The Everglades prove that the color of a healthy environment and the color of money are the same. Mother Nature is a capitalist. 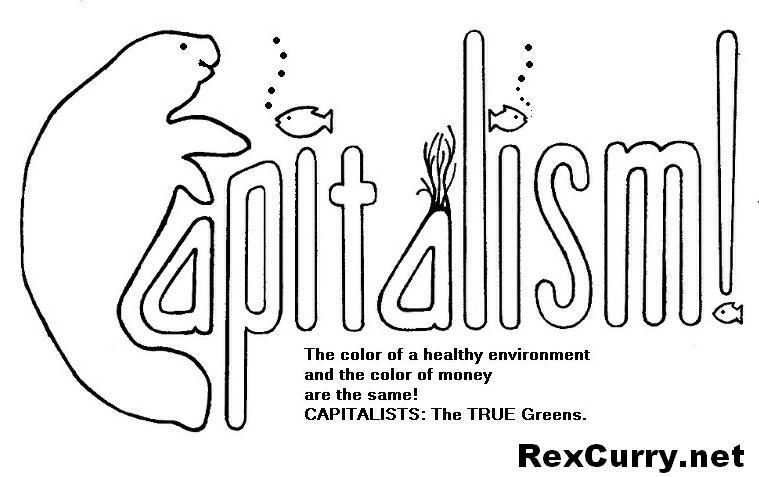 Capitalists are the true greens. Everglades land reclamation should be entirely private. Private water suppliers, developers, agriculture and everyone else will benefit. Holland's land reclamation started as private enterprise. Sell the Everglades. So, let’s go Dutch. RexCurry.net was the first website, or one of the first, to use the following phrases in a sincere positive manner: "Sell the Everglades" http://rexcurry.net/everglades.html and sell the oceans, sell the seas, sell the gulf, sell the lakes, sell the rivers, sell the parks, according to searches of the web and newsgroups. 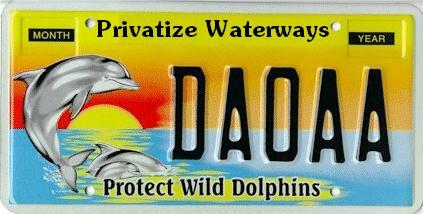 Fish farming is lauded, and government waterways are panned in new specialty license plate proposals (at http://rexcurry.net/ecotags.html and below). 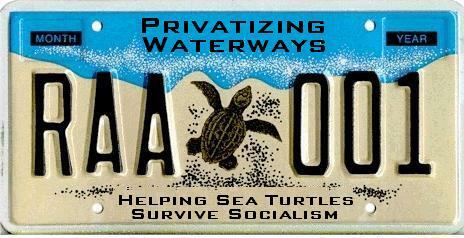 The specialty tags call for privatizing socialized waterways, and for protecting private aquaculture. 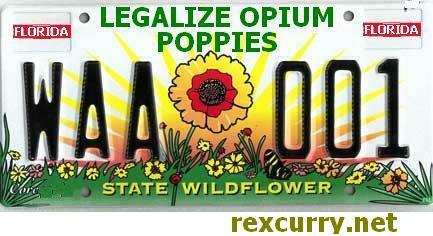 Florida would lead the nation as the first state to have the libertarian license plates. During my legal career, people have asked me if it is wise (or constitutional) for government to own and control so much water. Water is far too important for the government to be involved. The tags referenced here help fight antidisestablishmentarianism. The first car tag celebrates the farming of snook (& sturgeon) at the Mote Marine Laboratory in Sarasota, an effort to save the fish from the “tragedy of the commons” that snook have suffered under socialism in waterways. Mote also is raising Gulf and short-nosed sturgeon and has plans to include pompano, flounder and snapper in its program. Funding is through the William R. Mote Scientific Foundation. Another tag commemorates the farming of bass, including the popular Chilean sea bass that is enjoyed at many restaurants. this tag celebrates the farming of bass, including the popular Chilean sea bass that is enjoyed at many restaurants. See the work by the Eco-Capitalist Dr. Rex Curry. U.S. 1 ventures into Curry Hammock State Park on Fat Deer Key. Curry Hammock boasts stands of mangrove trees and palms along a group of small islands east of the Marathon built-up area. As an attorney I have been asked whether there is a legal way to grill Manatee. So far, I have not discovered a way. That is one reason why Manatee are endangered. If “sea cows” were farmed like other cows then people could eat them, they wouldn’t be endangered, and the many “manatee festivals” in our state could then provide culinary delights from their namesakes, as does the strawberry festival, tomato festival, rib festivals, seafood festivals, et cetera. A libertarian approach will save the manatee by bringing it closer to everyone’s heart (deep inside everyone’s stomach). It's a win-win idea for manatee and for people who love them (to eat). Capitalists can farm manatee by fencing them or by the more modern method using “homing” tags (transponders) to own and track manatee as private property. Manatee were used in history for meat, bone, hides and fat. Manatee were relied upon among ancient Indians and manatee hides were made into leather shoes, cords and shields, and the ivory-like bones were thought to have medicinal value. Florida Indians hunted manatee to supplement to their diet and may have sold excess meat to the Spanish. In the seventeenth century, shiploads of dried manatee meat were shipped from the Guianas to feed sugar plantation laborers in the Caribbean. Pioneers arriving in the nineteenth century shot manatee for meat, oil and hides, and poaching was common in parts of Florida during the Depression and World War II. Cowpens Key in the Florida Keys is thought to be so named because manatee were once penned in a small cove there as a food supply [from The West Indian Manatee in Florida, Copyright 1989, Florida Power & Lights Company]. 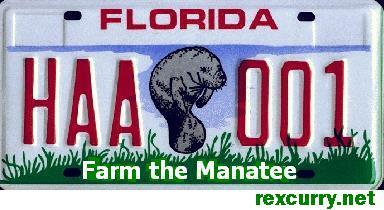 Despite the foregoing, actual farming of manatee has either not been tried, or has been outlawed. Environmentalists are endangering manatee with misguided, anti-capitalistic statism. Socialism is killing manatee. The lack of property rights in sea cows and in so much of Florida’s waterways makes it difficult, if not impossible, to farm manatee. Private property rights and farming keep chicken, cattle and many popular forms of restaurant fish off endangered species lists. Tuna is the “chicken of the sea” and the manatee is the “cow of the sea” and their cow-like qualities make manatee ideal for farming. Farming will produce manatee meat of greater quality and flavor, and insure that manatee never face extinction. Everyone should look forward to the day when there will be real manatee festivals, when manatee are included in all the seafood festivals, and when manatee will be as popular and abundant as other farmed seafood, meats, fruits and vegetables. 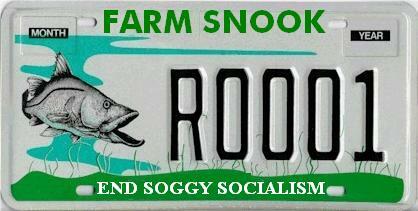 Or another bumper sticker: "Save the sea grass. Eat more manatee." As a Libertarian, I was distressed to see news reports that Mother Nature is murdering manatee with her cold weather. The news also reports that manatee are saved by capitalist electrical plants and their warm water discharge. manatee can be saved by building more electrical plants (and another benefit will be no rolling blackouts of electricity). Environmentalists and public officials must be prevented from interfering with the building of more electrical plants. More manatee can be saved if they are farmed where warm water is discharged. One way that capitalists can farm manatee is by fencing them in where warm water is discharged (another method is by using “homing” tags to own and track manatee as private property). If “sea cows” were farmed like other cows then people could eat them, they wouldn’t be endangered, and the many “manatee festivals” in our state could then provide culinary delights from their namesakes, as does the strawberry festival, tomato festival, rib festivals, seafood festivals, et cetera. The lack of property rights in sea cows and in so much of Florida’s waterways makes it difficult, if not impossible, to farm manatee. Socialism is killing manatee. A more Libertarian approach will save the manatee by bringing it closer to everyone’s heart (deep inside everyone’s stomach). I love manatee. They taste just like chicken. Manatee tastes just like chicken. Manatee taste just like chicken. I love manatee. They taste just like steak. Manatee tastes just like steak. Manatee taste just like steak. I love manatee. They taste just like filet mignon. Manatee tastes just like filet mignon. Manatee taste just like filet mignon. Manatee tastes like filet mignon. Manatee taste like filet mignon. I love manatee. It tastes great. I love manatee. They taste great. I love manatees. They taste great. "Tree Laws Kill Trees" by Dr. Rex Curry is now in print in the book "Americans on Politics, Policy and Pop Culture." 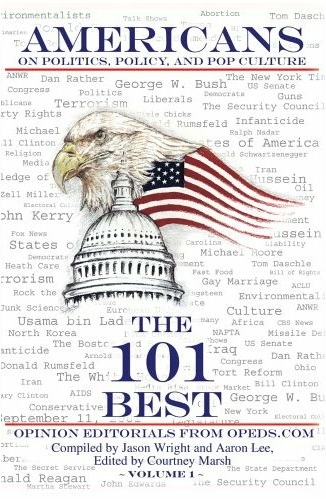 The book includes the 101 Opinion Editorials from OpEds.com, compiled by Jason Wright and Aaron Lee, and edited by Courtney Marsh. Tree laws illustrate the fatal conceit of socialism and its unintended consequences. Tree-huggers must have fallen out of a stupid tree and hit every branch on the way down. If public officials were any more stupid, they'd have to be watered weekly. If their antidisestablishmentarianism continues then more “protected” trees will die. Tree laws prove that socialism is environmentally disastrous. Government built roads through forests, straightened rivers, drained wetlands, cut canals, and subsidized other agricultural uses with taxes and other socialism. The government has already done more environmental damage than private enterprise could ever have afforded to do. RexCurry.net was the first website to state "Tree laws kill trees" http://rexcurry.net/trees.html according to searches of the web and newsgroups. Mother Nature is a Capitalist! http://rexcurry.net/artlibertarian/gyst_6b.jpg Mother Nature is a capitalist! Follow the socialists: Reject Socialism http://rexcurry.net/artlibertarian/yst_follo.jpg Follow the Socialists and reject socialism. Socialism is environmentally disastrous. Socialism is a disaster to the environment in so many ways.